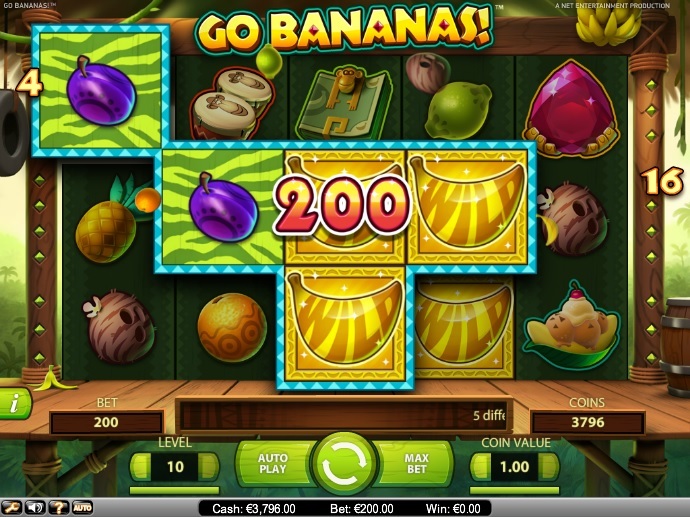 Go Bananas - Fun online Video slot. Play it for free! Launched in September 2014 at Net Entertainment (NetEnt) casinos, Go Bananas is one of the most unusual, unique, and innovative slots released by this provider. Its hottest feature is not one, but five wild symbols. Playing Go Bananas is as easy as playing any other NetEnt slot. Players have to first activate as many or as few of the slot’s 20 paylines. They can then bet up to 10 coins per active line and choose from a betting range of $0.20 to $200.00, which makes this an ideal slot for high-stakes as well as low-stakes players. After placing a bet, players can hit the Spin button, land winning combinations, and collect payouts. Since the slot comes with an Autoplay feature, players are saved the task of manually spinning the reels. Go Bananas gives players the delightful opportunity to interact with a few mischievous monkeys and to study their habitat. Lively tribal music plays in the background as players spin the reels, giving them a taste of tribal life too. The game features brilliant graphics, sound effects, and animations, all of which serve to enhance its tropical jungle theme and give players the ultimate slot gaming experience. The reels feature icons of different types of monkeys; juicy fruits such as oranges, bananas, limes, pineapples, coconuts, plums, and pink gems; and gold statues. On the downside, Go Bananas lacks a free spins feature. But players do not mind this as the slot has not one, but five wild symbols—the Langur, the Tarsier, the Baboon, the Orangutan, and the Gorilla. Whenever players get any of these wild symbols on the reels, they will substitute for the other symbols and help players spin winning combinations. In addition, they convert other symbols into wilds, giving players extra chances to plump their bankrolls. The Gorilla Wild can convert five symbols into wilds in the form of an X. The Baboon wild can convert three symbols into wilds in a vertical line. The Orangutan wild can convert four symbols into wilds in the form of a square. The Tarsier wild can convert two symbols into wilds either in a horizontal or a vertical line. The Langur wild can convert three symbols into wilds in a horizontal line. Players simply won’t have the time to worry about the lack of a bonus feature they will land a wild symbol across the reels with every spin. Go Bananas is one NetEnt slot that should not be missed. Initially, the lack of all the usual bonus features may disappoint players. But the presence of five lucrative wild symbols and the opportunity to win up to 140,000 coins will bring them back to this slot over and over again. Go Bananas is available for fun or real money at all casinos that offer NetEnt games.